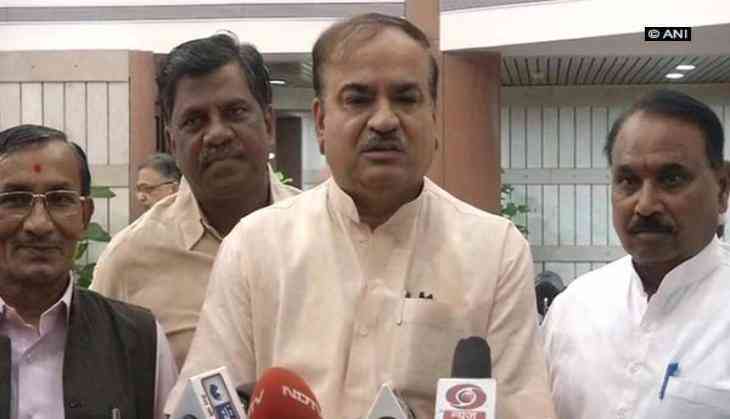 Union Parliamentary Affairs Minister Ananth Kumar on 1 August said that all Bharatiya Janata Party (BJP) members should be present in parliament till the session ends and added that those members not present would be taken seriously. Addressing the media here, Kumar said the Bharatiya Janata Party will hold a "Sankalp Yatra" from 15 to 30 August . "BJP will hold ' Sankalp Yatra' from 15th to 30th August. Under this, we will hold discussions on how India will develop till year 2022..Till Parliament is on, all members should be present, matter of members not present will be taken up seriously," he added. He further said that BJP president Amit Shah had expressed displeasure at the absence of party lawmakers from Rajya Sabha on 31 July and has taken a serious view of the matter. Shah told lawmakers at the BJP's weekly meeting of parliamentarians: "This is not a good thing as people have elected MPs to represent them in the House. It sends a wrong message." The upper House on 1 August saw high drama and embarrassment for the government as a Constitution Amendment Bill on backward classes was changed after some amendments moved by the Opposition were passed by the House. The Constitution (123rd Amendment) Bill, 2017, providing for setting up of a National Commission for Backward Classes, was passed after dropping Clause 3, to which four amendments was approved by the House earlier.